<RandAFK> So, where were we going last week? <Benhimself> Ebba laughing maniacally and preparing to smite earth with a 20-mile radius ball of rock? <Alexa> "Ebba! What are you doing?" <HollyhockGod> I presume that her Auctoritas widens as she does, but it still only goes about three feet from her body. <HollyhockGod> Then again, her roots are all tangled in the planet-shards. <RyanSherbrig> "Stand down, Ebba! This isn't the way!" <HollyhockGod> What are you aiming for, anyway? <HollyhockGod> I vote that you all just act to promote whatever it is your characters want, and I'll design consequences either way. <HollyhockGod> So, Ebba is a twenty-mile-tall tree with her roots holding together a tiny planet. Moon-sized, maybe? <HollyhockGod> The rest of you are standing on the world looking up at your giant Sibling, and probably yelling. <HollyhockGod> To clarify, I wasn't actually planning on "big changes" involving "a smoking post-apocalyptic crater," if that's what you are afraid of. <HollyhockGod> On the other hand, if you drop a planet on the Sable Gardens, it's likely that changes will happen! <HollyhockGod> I don't think you can turn objects into resolves. <HollyhockGod> Up from the ashes is sort of what you guys do. <RyanSherbrig> "Ebba! What are you doing?!" <RyanSherbrig> "Because I have to tell you, this doesn't exactly look good!" <Ebba> "I'm considering my options"
<RyanSherbrig> "And where exactly on /destroying humanity/ is your list?" <Ebba> "not there at all"
<RyanSherbrig> "I'm not sure what you expect a 20 mile ball of rock crashing into the Earth to accomplish, then." <Alexa> "Oh, wait. Sorry, I misunderstood." 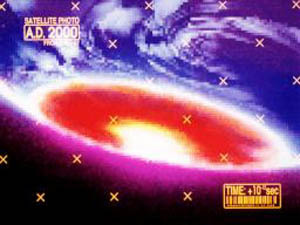 <HollyhockGod> Keep in mind that even if you do drop a crater onto the Earth, there's probably somebody who can absorb most of the shockwave, or at least clear away the dust clouds and prevent nuclear winter. <HollyhockGod> Of course, whoever you actually drop it on will have a bad day. <RyanSherbrig> "So what options ARE you considering?" <Ebba> "Should I allow these borken pieces of myself to impact the earth, and if so, in what form?" <Ebba> "The effets will not be so simple as large amounts of barren rocks falling from space"
<RyanSherbrig> "I don't think humanity is ready for your world yet." <Alexa> "I don't think *we're* ready for it yet." <Fiona> "I'm not sure it's ready for humanity, either"
<Ebba> "alas, there seems to be little remaining time available for preperation"
<RyanSherbrig> "Well, if we got it out of a collision course with Earth, that'd help dramatically, on many fronts." <Alexa> "Wait! Can we store the worldlet somewhere for a while until we find room for it to grow? Maybe in our Chancel?" <Fiona> "We could hide it behind saturn or something?" <HollyhockGod> Hm, I suppose that Realm miracles could put the worldlet into the Fire Isles. <HollyhockGod> Ryan would just have to resize the place so it would fit and open a large enough portal in the sky to let it in. <RyanSherbrig> Would doing so, so we don't endanger humanity by introducing Cneph-only-knows-what into the ecosystem, count as service to the Light? <HollyhockGod> Well, the Chancel is a separate space. <RyanSherbrig> It's definitely protecting humanity in Ryan's perspective. <Alexa> "Because, Ebba, you'd want this world to regrow into itself, wouldn't you, not some Earth-Yggsgarde hybrid?" <HollyhockGod> So I suppose you could award yourself MPs if you liked. <RyanSherbrig> "Yes! We could fit it in the Chancel!" <Alexa> "As long as the boss-lady is okay with it. Only one and a half ways to find out." <Alexa> "Ebba? You've gone quiet." <Ebba> "I'm sorry, the song of the world takes up much of my attention"
<HollyhockGod> I suppose a Greater Change is pretty much what it would take. Alexa stretches out a flaming hand, close enough to warm one of Ebba's branches, not close enough to burn. <Fiona> "Alexa, what are you doing?" Alexa pulls her hand back. <Alexa> "Just trying to be comforting. I don't know what to do." <Ebba> "we could try to change the fragments into something that retains their essential nature, but will not be as destructive on impact"
<Fiona> "oh. I don't, either." <RyanSherbrig> "The bad news is that, since I did just make that whole floating-island-observatory, stretching the chancel's borders might be beyond me at this point." <Ebba> "would that we knew, then it would be a simple matter of resolve"
<Alexa> "But why, Ebba? What do you want to achieve?" <RyanSherbrig> "Fiona, you've got a fair degree of latitude in metaphorical connotations of your Estate, yes?" <Fiona> "possibly? I haven't really tried to find out how much"
<Ebba> "Each world has it's own song. I must confess I have little love for the song of entropy"
<RyanSherbrig> "I have less of a love for the One Song of the Excrucians, myself." <RyanSherbrig> "So Entropy's remains a necessary refrain for now." <RyanSherbrig> "We can deal with that after we vanquish the Dark." <Alexa> "There's so much more to Earth's song than him!" <Alexa> "And mixing in new, ah, tunes isn't necessarily going to get rid of Entropy, anyway." <RyanSherbrig> "Just cause harmful dissonance and overextended metaphors." <Alexa> "Is that what you want, Ebba? Do you want to subject your world to Entropy's rule too?" <HollyhockGod> Oh, so you want to just crash the thing on top of Lord Entropy's Chancel? <HollyhockGod> Or he'll be dead. <HollyhockGod> Well, they didn't have the rapidly blossoming energy of a developing world to throw at things. <Ebba> (back to answering alexa's question) "My world is gone, if some of it's song can be preserved by combining it with Entropy's then it is better than non-existenve"
<Alexa> "But wouldn't it be even better to look for a way to give it its own Entropy-free existence?" <HollyhockGod> Since that's where the rocks were going in the first place. <RyanSherbrig> "Okay, Ebba, choice time. Park your world in our Chancel, not knowing what influences that might have on Chancel and World alike, or keep it floating space for a while we come up with an alternate plan? Or just send it back somewhere to the Tree?" <Ebba> "I don't think parking it in space will be possible. WE all saw it change course. Whether that was simply because I was where it wanted to be, or some other power acted on it, I don't know"
<Alexa> "Now that the fragments are all together, are they giving you any more info on how they came to be up here?" <HollyhockGod> They sort of want to me alive, so they homed in on the world that had Ebba on it. <HollyhockGod> That's the impression Ebba gets. <Alexa> "Or where they came from? Did anyone send them?" Alexa is talking in hurried but less stressed tones, relieved at the possibility that Ebba might be listening to reason. <HollyhockGod> Doesn't seem like it. <RyanSherbrig> "Well, you're going to need to make SOME decision before this thing crashes into the planet." <Ebba> "Yes, parking the pieces somewhere where I am not will be very difficult, if not impossible. They seem wish to seek me out"
<Fiona> "hiding it in our chancel seems good then." <Ebba> "can Ryan get us there?" <RyanSherbrig> "With help from Fiona, yes." <RyanSherbrig> (If this did become a throwdown, Ryan would be rolling in MP from Fervent. Suckah! <HollyhockGod> So, you're going to park it in the Chancel? <Fiona> assuming Ebba doesn't stop us, I think so. <HollyhockGod> All right, Ryan can open a portal positioned to take them worldlet into the Chancel, and Fiona can start bringing it back to life. <HollyhockGod> Ebba just needs to steer the thing into the Pacific. <RyanSherbrig> Ryan opens the portal! With a bit of expenditure of SMP. <Fiona> "towards the chancel, I guess"
<RyanSherbrig> "Well, I doubt we happen to be on exact course to the Chancel. Although if it is following you…"
<HollyhockGod> I think Ebba can direct it enough to get it into the portal. <HollyhockGod> I'll also assume that Alexa protects you from the effects of atmospheric reentry. RyanSherbrig sends a ghost miracle warning the floating observatory island to steer clear. <HollyhockGod> And, with that said, you manage to splashdown a moon-sized planet into the Fire Sea, sending out a colossal tidal wave and drenching everybody. <HollyhockGod> Which is honestly a welcome change of pace. <HollyhockGod> Now you just have to figure out what to do with it. <Ebba> planet safely (for certain values of safe) down in our chancel? <Ebba> "to be ready for war, prepare tea. and try to get people to switch thier MP around during the discussion"
<Fiona> do we want to end the session here? <RyanSherbrig> Barring any surprised the HG would like to spring on us. <HollyhockGod> No, I suppose we're done for now. <HollyhockGod> The Excrucians can pop out next weei. <borogove> our games normally have more talking in character, and less out-of-character discussion, though. <Benhimself> Maybe next time some NPCs can come visit to find out what that whole 'worldlet crashing into the sea' thing was. <borogove> anyway, I should probably go now. will see people next week. <HollyhockGod> Now, of course, you'll have to deal with the mysterious disappearance of one of your Siblings. <Benhimself> On the plus side, we've got a monopoly on the world's supply of Scribeblossoms! <HollyhockGod> Also, coping with a bunch of nosy Powers who want to know what you're going to do with all the pure causa you told E'jah about and are now presumably hiding in your Chancel and building a universe out of. <Uqbarian> Wait, what? I thought we determined last session that this wasn't pure causa after all? <Benhimself> They may not believe that! <Benhimself> "Our universe will be better than yours! It'll have blackjack! And hookers!" <Benhimself> E'jah looks at his Bissonomy-based universe, and cries a little. <Benhimself> Commas pour down his serifs. <Benhimself> It's a hitherby dragons reference. <Uqbarian> I keep meaning to read hitherby. <Uqbarian> Hey, Mr HG, how many CPs have we earned so far? I don't think I've spent any yet. <Benhimself> I think we were at 3? Maybe 4, if this counted as a story? <Benhimself> Hmmm, 1 away from potentially being a Tempest. <Benhimself> Although some Aspect or Spirit wouldn't be amiss, the siren call of 2-rmp Major Creations calls to me. <Uqbarian> And any further thoughts on Alexa's interlude, or have we dropped that? <Benhimself> You could finish it up in chat. <Uqbarian> Sounds good to me. <Benhimself> "Join me, Alexa! Together we can rule the chancel!" <Benhimself> "All I ask is BLOOD." <Uqbarian> "Right. My blood, or will anyone's do?" <Benhimself> "Well, I was kind of all ready to take whathisface's, there." <Benhimself> Except Maebara. But who cares? Poncy jerk. <Uqbarian> Oh, we can give him more blood with a Realm miracle, can't we? <Benhimself> Without Rebirth, you'd just end up with a fairly sanguine corpse. <Benhimself> Fortunately, Pandora is… oh, right. <Benhimself> All right, I'm off for work. Thanks for game, all! I had fun. <HollyhockGod> I leave for a minute and you start killing my NPCs and melting islands? <HollyhockGod> I was totally hoping you'd crash the planet into the Sable Gardens. <HollyhockGod> I was going to have it kill the First Lord and result in all the Magisters of Light and Dark subliming into nothing, leaving only their Powers behind. <Benhimself> We get rite-of-rescued by Lord Entropy. "Good job, guys." <Benhimself> You know… playing the powers of one of the two members of the Council of Four who aren't Entropy or Ananada would be interesting. <Benhimself> The self-serving Wildlord or the hypertraditional unknown-affiliation one. <Benhimself> Well, it's not defined, so, y'know, however many PCs you have.